An island located in the Bay of Bengal that were a cause of fighting between India and Bangladesh over the last thirty years, has been engulfed by waves two days ago. So the rising sea levels caused by global warming was responsible for finally resolving the dispute between the two countries. Named "New Moore" by the Hindus and "South Talpatti" by the Bengalis, the island of 2.5 km² ((27,000 sq ft) located in the Sunderbans, emerged in the aftermath of the Bhola cyclone in 1970, first discovered by a U.S. satellite in 1974, has been swamped by the waves. Before, various remote sensing surveys showed that this unhabited island had expanded gradually to an area of about 10 km² (110,000 sq ft) at low tide -at most, about 3.5 km (2.2 mi) in length and 3 km (1.9 mi) in width-, including a number of ordinarily submerged shoals. The highest elevation of the island had never exceeded two meters above sea level. Announced by oceanographer Sugata Hazra (a professor at Jadavpur University in Calcutta), this disappearance was confirmed by satellite images and marine patrols. "The two countries failed to resolve during the years of talks was set by global warming" quipped Sugata Hazra warning before a dozen other islands of the archipelago could also disappear. 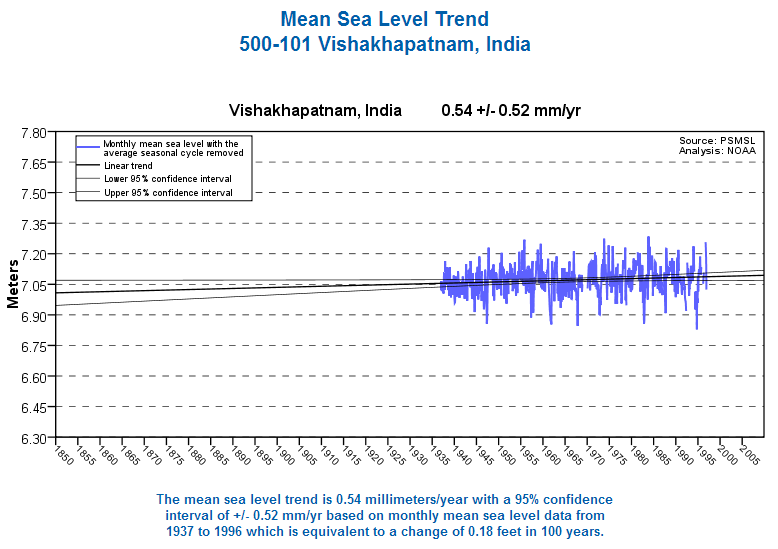 Scientists at the Jadavpur University have indeed found an alarming rise in sea level over the last ten years in the Bay of Bengal. During the last decade, the increase has reached an annual average of 5 mm (3 mm until 2000). Bangladesh is and will be one of the countries the most affected by global warming, its 150 million inhabitants living mainly in a delta close to the level of the sea. The Bangladeshi authorities think that 18% of the coastline will be submerged and 20 million people have to be displaced by 2050 if, according to expert forecasts of climate, sea level rises one meter over the next four decades. This is the result of Google Earth's new ocean initiative leading multiple institutions and governmental organizations to supply bathymetry data for the three-dimensional backdrop required for Google Earth users to explore the ocean world. 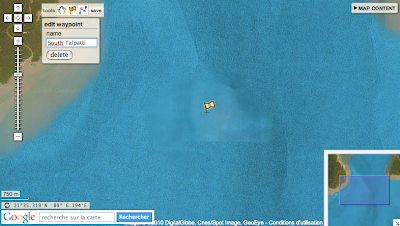 Note : as bathymetry is not available in Google Maps (2D), Marine GeoGarage proposes to view bathymetry clicking Map content/background/'Physical' layer. 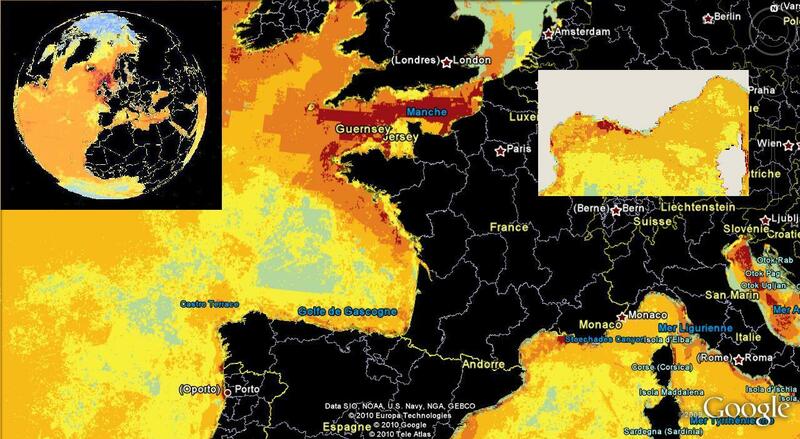 The University of California, UC Santa Barbara, through its 'NECEAS National Center for Ecological Analysis and Synthesis' department has mapped the impact of human activities on the oceans. Researchers have also modeled integrated and marine ecosystems such as seagrass beds, marshes, mangroves, coral reefs and mudflats. Hundreds of experts from various marine ecosystems have crossed their own data with the levels of these 17 factors, and all results have been modeled on a scale of 1 pixel per 1 sq km of ocean. The map gives a mathematical value (between 0 and 20) the environmental impact of each point without being able to specify the exact nature. The coral reefs are among the most affected, but contrary to popular belief, the deep areas are sometimes more affected than the coastal area. Among the most affected waters: ocean space located between Japan and China, the North Sea between the UK and Norway, the north-eastern United States, the Bering Sea. The area least affected are mainly near the poles. This map highlights the need to take into account the cumulative effects of various pollutants. The interviews given by the scientists behind this work are alarming but not negative: the collaboration between researchers and industrialists, fishermen, shipping, may lead to changes in practices conducive to improving the marine ecosystems . The FCC's Consumer Broadband Test enables US consumers to test the quality of their broadband connections. The FCC says it may use data collected when you run the Consumer Broadband Test, along with a street address you may have contributed, to analyze broadband quality and availability geographically across the US. Two consumer broadband testing tools have been selected by the FCC for this test which measures bandwidth and latency. Tasty beat sequences and abyssal ambient noise make this a massive Dubstep classic. Will the Arctic be free of summer ice in 30 years? In a work published in Geophysical Research Letters, a Japan-US team proposes another way, (additionally to the planet's warming) for explaining the rapid disappearance of sea ice in the Arctic. The three researchers have studied the wind regime in the Arctic Ocean for 31 years. And they have noted that it has changed. Moreover, they reveal a direct link between weather anomalies (located north of Greenland and in the Beaufort Sea) and the minimum extent of polar sea ice, raised each year in September. Basically, the winds tend to push the ice towards the south, and get them across the Fram Strait, the gateway to warmer waters leading to their rapid disappearance. According to this work, the wind patterns explain half the variation of ice extent recorded from one year to another. On a scale climate (the 31 years of the study), winds explain about one third of the trend towards reduction of Arctic sea ice at the end of the summer. That is a second figure more representative of what is a climate, whose evolution is measured in decades rather than one year to another. The researchers also stressed that their results on wind regimes contradict others. Further work will be needed to decide. Meanwhile, a question mark remains, which no one can answer today: what is the origin of weather regime changes during summer in the Arctic? Global warming is not just hot air or hot water, which melts the ice. In short, these mass movements southward may be linked, or not be linked to global warming. That is the question. Ancient nautical treatise, generally though to deal with navigation, which to the present day has resisted all attempts to decipher it. Often found on board ship as a decorative element or paperweight. 1) Opposite of girlie or flying gull. 1) Large piece of paper that is useful in protecting cabin and cockpit surfaces from food and beverage stains. 2) Type of nautical map which tells you exactly where you are aground or what you just hit. 3) A map that confirms to the user that they don't know where they are, while allowing them to convince others that they do. 1) A course leading directly to a reef. 2) What a Southern Doctor pronounces after a sailor goes to Davy Jone's Locker. 3) Using a map instead of a chart. 1) The estimated position of a boat. 2) True position a boat and its crew in are in most of the time. 1) Ship's course when the rudder is jammed or stuck..
2) Depression left in a seat cushion. 3) Mark around your eye after sailor's pub brawl. Long voyage from A to B, interrupted by unexpected landfalls or stopovers at point K, point Q and point Z. 1) The fine art of getting wet and becoming ill, while going nowhere slowly at great expense. 2) Standing fully clothed in an ice-cold shower tearing up boat bucks as fast as you can go. They did it ! In less of 50 days. Jules Verne Trophy is now held by Groupama which has beaten the round the world record under sail via the three capes, circling the World in 48 days, 7 hours, 44 mts (an average actual speed of 24.6 knts and 28,523 sailed miles whilst the official optimum course amounts to 21,760 miles) after 2 failed attempts. Setting out on 31st January 2010 whilst the weather `window' was not particularly favourable, how a few days at 25/30kts changes a 600+ mile deficit (so about 1 day in relation to the 2005 reference time of Bruno Peyron's Orange2) thanks to a dazzling final sprint from the Equator, to lowering record by 2 days! Thomas Coville, back on the team spirit that reigned aboard Groupama 3 : "We gave our opinion when it was requested or when we had something to contribute to the group, but overall we had a respect for the decision which had been taken. Decision team was especially Stan and Frank. We were in complete confidence. There are times when maybe we would have personally done differently. But the force we have had was to have a group that acted as a group and not by ego. When one has a different view, it is sometimes important not to show or to assert in order to enable the group to be right. We have all respected that so Frank and Stan were in the best condition to take the best decisions."